Nancy is a single mother living in the Kiamaiko slum community of Nairobi, Kenya. She’s 38 years old and a mother of three boys: Kenneth (freshman), Reuben (7th) and Francis (3rd). When the boys were still very young, Nancy and her husband separated after a long period of marital conflict. Nancy embraced the huge responsibility of raising these young boys as a single mother. Back then she was a very active woman who could take care of her family. She earned money through doing different odd jobs like washing clothes. Nancy began to experience joint pain. She went to different health centers and got medication to manage the pain. This continued for close to a year and the pain got worse. 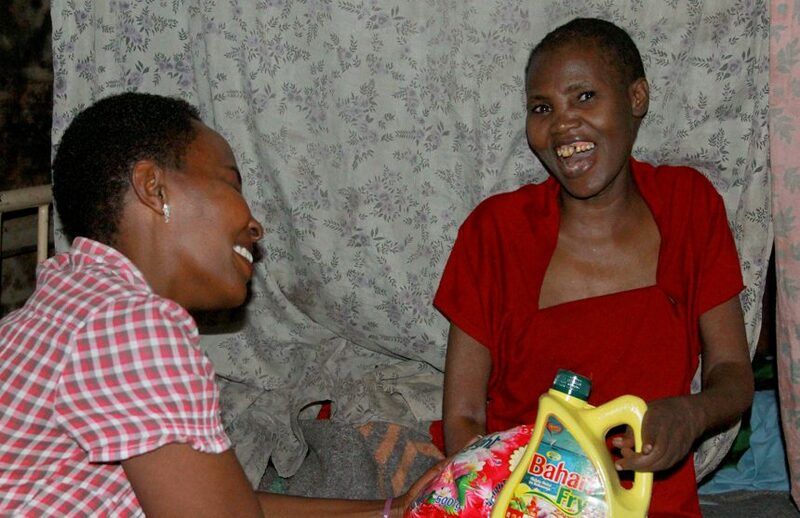 Eventually Nancy was taken to Mbagathi Hospital where she was admitted for a month. A specialist confirmed that she was suffering from an advanced stage of arthritis. At this point she couldn’t even walk by herself. When she was discharged she came home, but still her health continued to deteriorate. Ever since she has been confined in a wheelchair and has not been able to work. Even support from extended family ran out. Nancy’s son Reuben back in school. She was bedridden and helpless and her three sons left home for the streets. This is when Nancy got connected to a MOHI social worker through a neighbor. The social worker visited her home and recruited her children into the MOHI program. Nancy’s second son had fallen into an addiction of sniffing glue. Through the help of a MOHI social worker and a CHE trainer, he was taken to a rehabilitation center for two years. 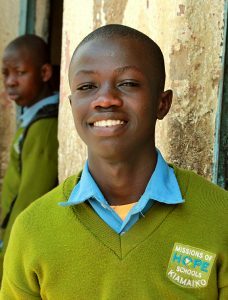 He is now back to school in our Kiamaiko Center in seventh grade. Nancy depends on MOHI for the education of her boys. Because of their extreme circumstances, the normal commitment fees for families have been waived. In addition, the boys take home food everyday after school for supper with their mom. The community has been very supportive of Nancy. Some will visit her and do the chores around the house or visit and bring them meals. Recently Nancy was given a collection of food and household supplies by her MOHI social worker, Margaret. These gifts have been made available throughout 2018 for MOHI to give away to those in special circumstances because of generous donations to last year’s end-of-year “Food Baskets” fund. Thank you to all that gave. These funds have blessed many of our most vulnerable families! Watch this video to see Margaret blessing Nancy with these supplies in her home. Thank you for your loving care for these dear people in the Kiamaiko community in Nairobi, Kenya! We are blessed to sponsor two girls from this community! Love seeing this video! July Kilimanjaro team beats their goal!